Starring Sean Combs, Tony Award nominee Sanaa Lathan, four-time Tony Award-winner Audra McDonald, and Tony Award-winner Phylicia Rashad in the film adaptation of the timeless play by Lorraine Hansberry. Watching A Raisin in the Sun reminded me of “To Kill a Mockingbird” and “Roll of Thunder, Hear my Cry”: two books that I read while I was doing Literature in secondary school. A common, recurring theme in all three is of blacks growing up during a time where they have to fight against mounting white oppression and racism. If you are interested in history and such, you might be very well impressed by this TV movie, starring a fairly unknown – but talented – cast… that even includes famous, and controversial rapper, Puff Daddy aka Sean Combs! Interestingly, A Raisin in the Sun, originally performed as a play, was the first to be written by a black woman, Lorraine Hansberry, and directed by a black director, Lloyd Richards) for production on Broadway. And if you are wondering about the rather strange title, it actually comes from a poem by Langston Hughes, “What happens to a dream deferred? Does it dry up… like a raisin in the sun? "; they also served as opening lines to the movie. These lines very much sums up the general theme of lost causes and dreams as the Younger family contends with the trials and tribulations of their lives and the consequences of the individual sacrifices some of the members have to make. The main catalyst in this case is an insurance check of $10,000 billed out to Lena Younger, the all-sacrificing matriarch of the family (played by the excellent Phylicia Rashad) – a sum of money of which cannot appease and fulfill the dreams of every member in the family. 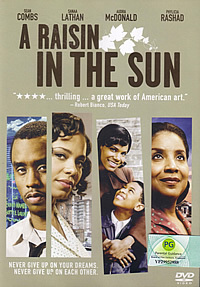 Although A Raisin in the Sun can get a tat too melodramatic for my liking – especially during scenes between Walter (Sean Combs), son, and Lena – and because of that, some of the actors tend to fall into a vicious cycle of “overacting”, it is still an interesting movie supplemented with solid acting from the cast. Sanaa Lathan gives an earnest performance of a highly educated woman and aspiring doctor, Beneatha Younger, who is torn between her self-absorbed ideals and love for her family. Likewise, Combs gives an interesting interpretation of an angry and ambitious man hungry for power and money in a surprisingly well thought-out performance. However, because the movie deals with serious and mature issues such as abortion and financial problems in an era long gone, A Raisin in the Sun might get a little too dry and preachy (“doing what’s right for your family”) for the younger audience. This is strictly for the older audience and history buffs who are eager to gain a personal insight on the lives of and problems faced by an African-American family in the 1950s. Some couple of trailers – Hancock, First Sunday – are available. Also, viewers have the option of turning the commentary with director Kenny Leon on while watching the movie. Most importantly, the DVD comes with an insightful and interesting clip – “Dreams Worthwhile: The Journey of A Raisin in the Sun” – where the original and current cast shared their thoughts on making the movie. Nothing out of the box in the audio and visual department except the usual Dolby Digital and Anamorphic Widescreen presentation.